Perry Twins | Azazel's Bitz Box. 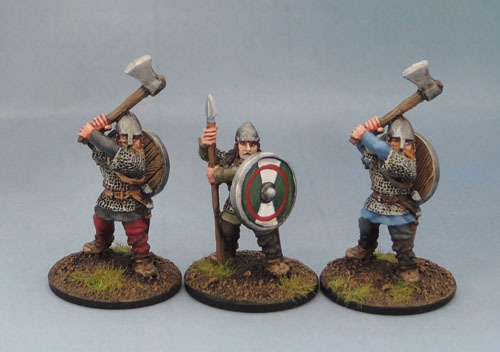 Finally, I’ve finished these metal Viking models. 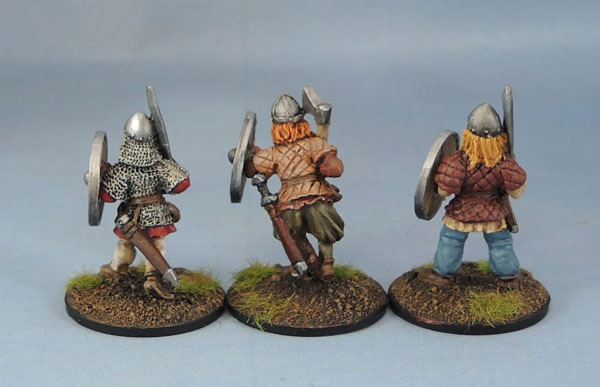 These are the final five of my Perry-sculpted Wargames Foundry rebadged 1986 Citadel F8 Vikings. 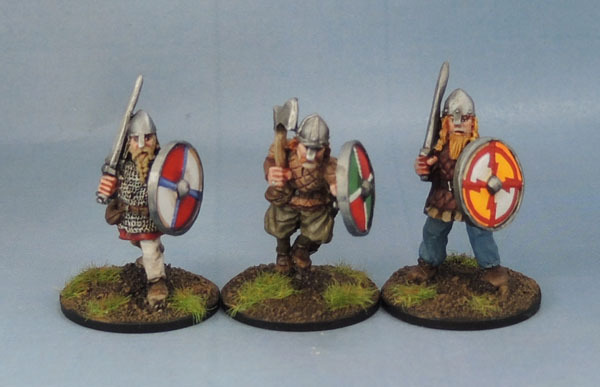 This little group also completes “Book Two” of my Vikings. “Book One” can be found here. They were intended to be the last of the models I completed for Squad: March, but it didn’t work out that way. Because Shields. 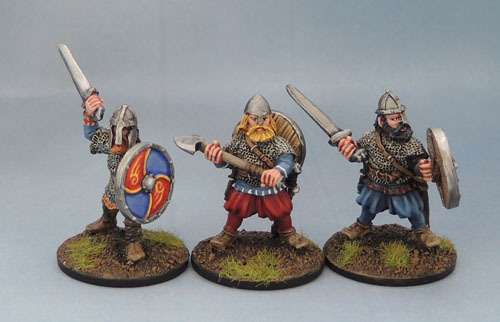 The last time I finished any of these Perry/GW/Foundry Vikings was actually last August, so these guys have been siting around partly done for a bloody good while there – so these monthly challenges are definitely working for me in terms of helping to motivate me to finish off stuff that’s been sitting around. 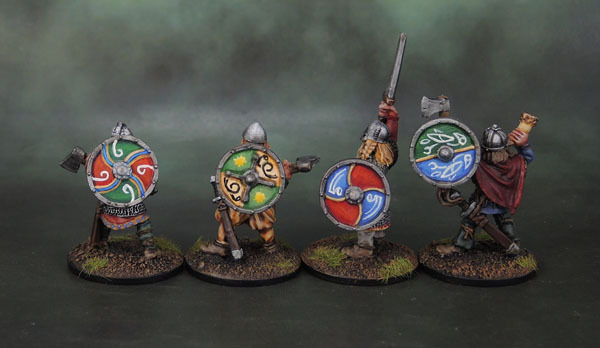 The “money shot” for my Vikings – the freehand shields. Unfortunately, getting sick for over a week with this throat -> chest infection really messed up my painting plans for last month, and now I’m just tired and grumpy all the time as I work my way through the endless cough that it left me with. “Book Two” of my Vikings, finally completed! Anyway, here’s a group shot of those “Book Two” models I’ve completed so far. Hopefully it won’t be long until the final five join them! Another pair of Vikings today! Not a whole lot to write about them – one model is duplicated from the ones shown last time, and the other is nothing special, and has an annoyingly awkward hand/shield boss hole. 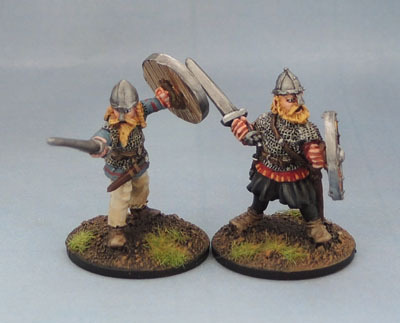 Having completed these two, I’m left with only another five to go from the sixteen Perry Vikings I picked up from Wargames Foundry. 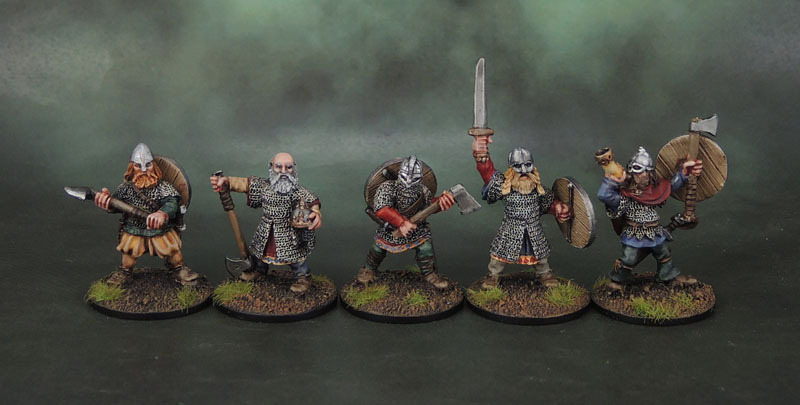 Of course, the final five are my favourites from the set, which is why they’ve been bumped to the back so much, and also why they’ve barely got anything past their chainmail done to date. On one hand, while the models themselves are nothing too exciting, on the other hand I’m quite happy with the shield designs on both of this pair. I haven’t really done anything especially like them before. Next up for the vikings will be a “Book Two so far” post. Hopefully not too far behind that will be the rest of these Perry Vikings. Here are the next trio of “Book Two”s Vikings. 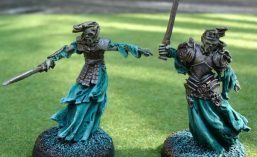 As you may have guessed, following the stuff I do en masse, like the chainmail – I tend to paint, and especially complete them in duos and trios based on a similar palette. 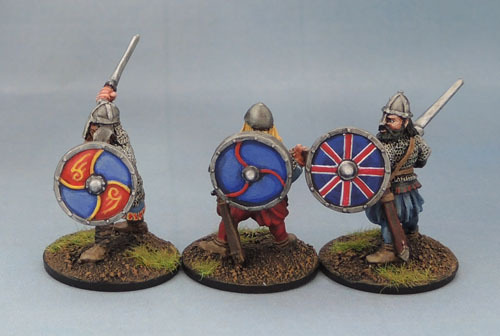 While it might give these three guys a superficial feeling of being overly red-blue while together, once they’re all mixed in together with the other Viking models, it’s all much more varied. 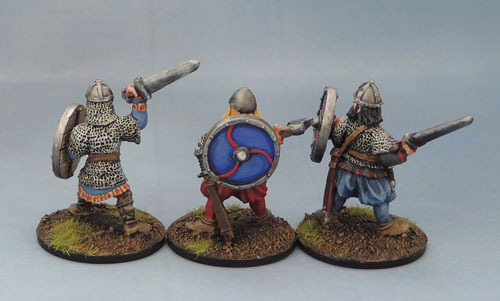 The next three models of “Book Two” of my Vikings. 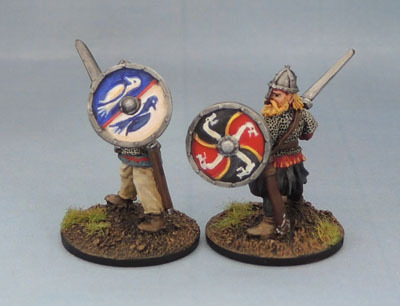 Once again these are from Wargames Foundry‘s, rebadged 1986 Citadel F8 Vikings. I’ve actually painted the duplicated axemen before, painted back in March/April, I guess the fact that he’s a dupe explains why Cannon was happy to pass the model on. Hopefully I’ve made the three of them look at least a little distinct from one another when they get used on the table. So I’m back. It took the better part of a week to back up and replace the hard drive (still have my Steam folder to add to the external HDD backup). I’m feeling better in relative terms in that I’m over what I believe was the flu, and am down to more general, low level winter cough and cold misery. The more important family health stuff is ongoing and slow, but will hopefully work out to 100%, though there’s a couple of months on that road yet before it’s done. Thank you to all of you who left comments in the previous post, and apologies for not having replied individually. 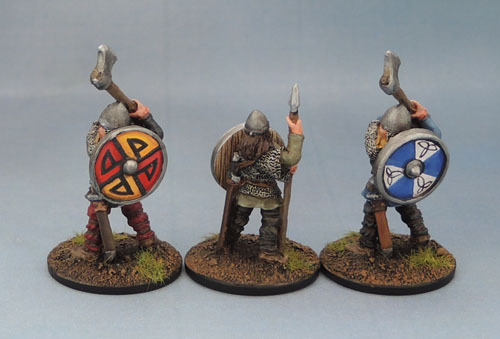 These figures mark the beginning of “Book Two” of my Vikings. 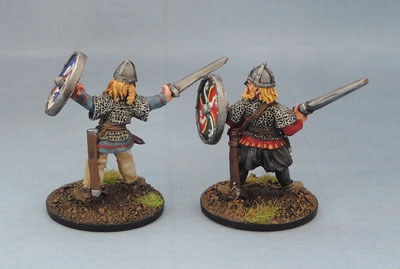 Cannon’s ones are all now done, so we’re onto the Vikings that I’ve actually purchased myself. 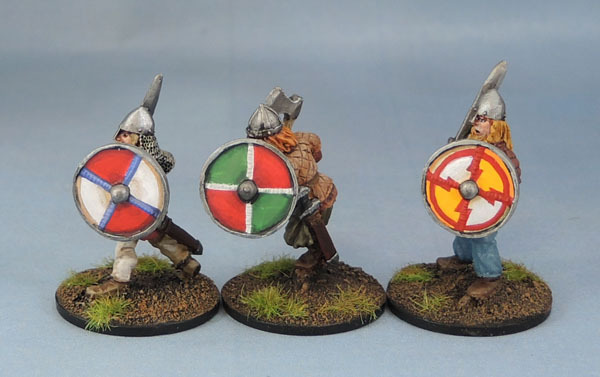 These three are from Wargames Foundry, and are in fact the old 1986 Citadel F8 Vikings “Oldhammer!” that Bryan Ansell moved across from Citadel to Foundry back in the day. I picked up two of the packs awhile back (VNS001, VNS004) and skipped the berserkers and archers for now. Finally, the shields. This trio is pretty simple, though I do like the yellow/white/red one. I may reuse that particular pattern on another shield or two as I move through the rest of the metals. Another seriously Oldhammer blast from the past is this guy. 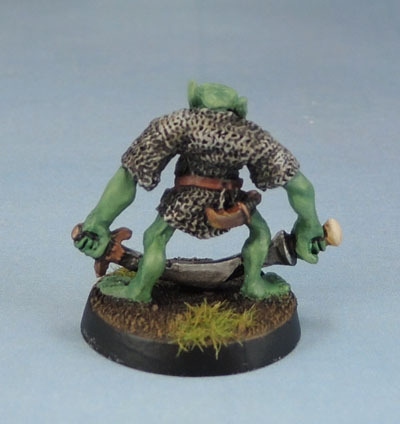 Known as “Cyclops” in the old catalogues for rather obvious reasons, this Orc was sculpted by the Perry Twins, and the earliest reference I can find to it is in the Autumn 1985 Citadel Journal. 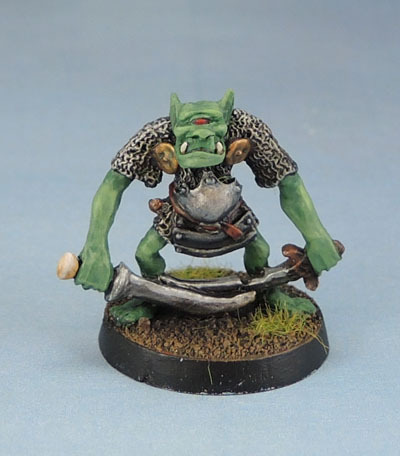 Thanks to a little bit of extra research spurred by IRO, it turns out that this guy was also the designated model for Fangor Gripe, Chieftain of the vile Rune Orcs in the classic WHFB 2nd Edition Campaign Blood Bath at Orc’s Drift. I was rooting around in my metal O&G box for some more models to paint after completing the previous batch (which I haven’t fully shown yet, but soon!) and this guy stuck out to me. He’d previously been overlooked as a ratty old figure that never especially appealed, but since Nostalgia is the new black, and more importantly, he’d clearly paint up pretty quickly I fished him out and made him have the colours. I tried to do something interesting with his breastplate and the metals, mixing both a brown and blue tone. but I fear it’s too subtle in these photos, let alone in person. Something to folllow up on down the line, though! A simple and straightforward paintjob here. It’s not a flashy model, and most of it’s interest comes from its cyclopean nature (*edit: And his named spot in the Orc’s Drift Scenario.) If it had two eyes, it wouldn’t even have a whole lot of that nostalgia-based “character” and would be a pretty unassuming and generic orc for the middle or back rank of some unit. Still, it’s another one down, and it’s enough of a curio that it gets it’s own blog entry today. It’d be pretty funny to use him in an AoS game, though – so I’ll have to do that whenever I get around to trying out the game.